A group of blue whales that frequent the South Taranaki Bight (STB) between the North and South islands of New Zealand appears to be part of a local population that is genetically distinct from other blue whales in the Pacific Ocean and Southern Ocean, a new study has found. The whales show a high level of residency, researchers say, as hydrophones deployed in the region recorded blue whale calls on 99.7 percent of the days between January and December in 2016. The study, led by Oregon State University's Marine Mammal Institute, is important because the South Taranaki Bight has several oil and gas extraction rigs and the New Zealand government recently issued its first permit for mining the seafloor there for iron sands. "We had five hydrophones deployed for two years in the STB and we never heard any Australian blue whale calls—just the local New Zealand population," said Leigh Torres, a principal investigator with OSU's Marine Mammal Institute and co-author on the study. "When we conducted biopsies of individual whales, we also discovered that they are genetically distinct from other blue whale populations." This journey of discovery began in 2011 when a colleague told Torres that observers aboard seismic survey vessels had spotted nine blue whales. Torres thought it was unusual, and began looking at whaling records, which suggested the South Taranaki Bight region historically was a minor "hotspot" for blue whale activity. 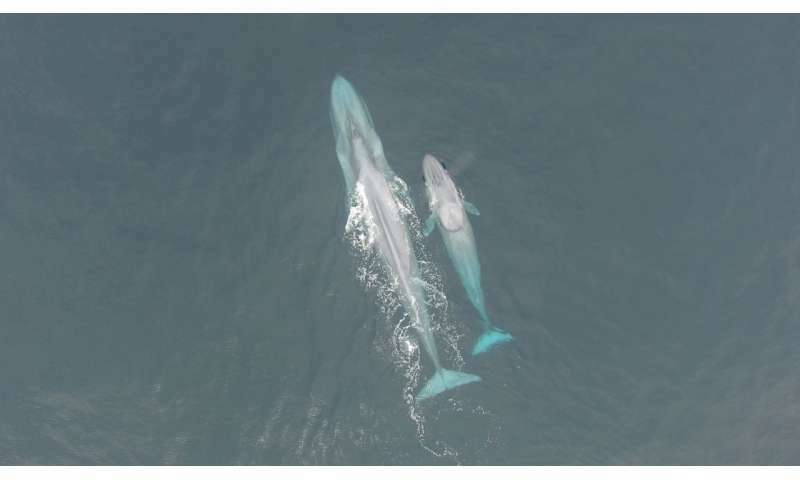 She then assessed oceanographic patterns and found documentation of local upwelling that "supports aggregation of a certain krill species that blue whales like to eat." In 2013, Torres wrote a paper hypothesizing that blue whales may use this region because of a steady food supply. 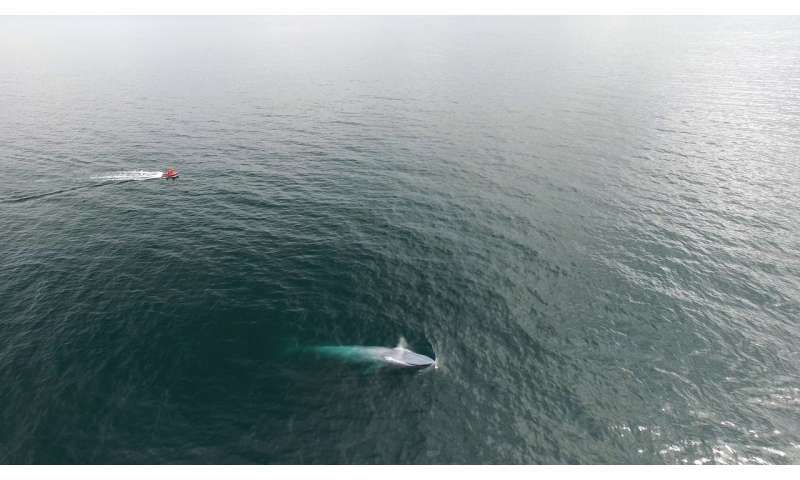 She said she received pushback from industry, resource managers and even other scientists because the blue whale is listed as a "migrant" by the New Zealand Threat Classification System. So in 2014 she led a 10-day research expedition looking for blue whales to see if they were foraging in the area and during that study she and her colleagues identified roughly 50 blue whales. That led to more questions, including whether the whales were part of a migratory population from, say, Australia, or were potentially a distinct New Zealand population. Torres and her graduate student, Dawn Barlow, led longer surveys in the summers of 2016 and 2017, trying to determine the abundance, distribution patterns and population structure of the New Zealand blue whales. They used biopsy darts to determine the genetics of the whales, compared sightings with photo IDs of whales from other regions, and listened to the hydrophones deployed in the region for two years. They were able to identify 151 individual New Zealand blue whales between 2004 and 2017 by examining various photographic evidence and then used that and other data to estimate their overall abundance. "There is no doubt that New Zealand blue whales are genetically distinct, but we're still not certain about how many of them there are," Barlow said. "We have generated a minimum abundance estimate of 718, and we also were able to document eight individuals that we re-sighted in multiple years in New Zealand waters, including one whale seen in three of the four years with a different calf each time, and many others we saw at least once." Torres said the OSU researchers are "working closely with resource managers in New Zealand to help them understand what we do and don't know about this New Zealand blue whale population so they can apply best management practices to minimize impacts from industry." 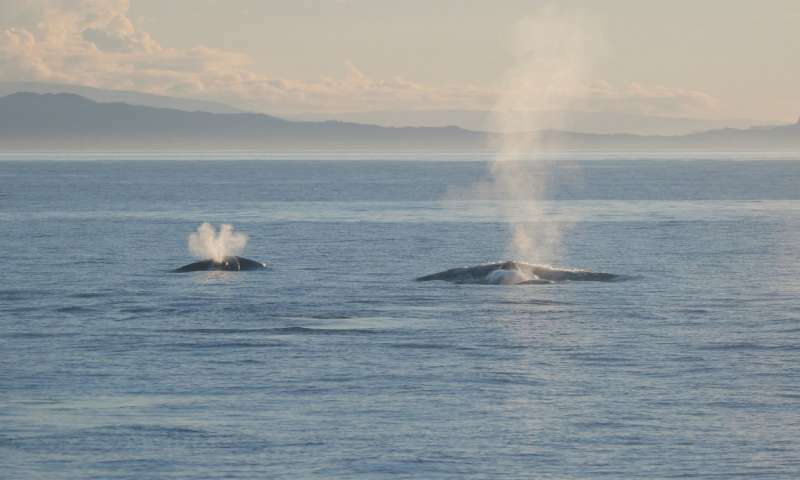 "While we have gained a great amount of information about blue whales in New Zealand over the past few years, we continue to analyze our data and do more research to address other knowledge gaps." The blue whales found off New Zealand, Australia and Chile are not quite as large as Antarctic blue whales, which scientists believe to be the largest animals to have ever lived on Earth. Antarctic blues, when they reach adulthood, can range from 28 to 30 meters in length (nearly 100 feet). The other blue whales, though slightly smaller, are still formidable at about 22 meters in length (or 72 feet). The Oregon State researchers will return to New Zealand in July and meet with government and political leaders, as well as industry representatives. They also are presenting their data to the International Whaling Commission.